The next time you want to sit in an auto and if it looks brand new please be careful, you might be sitting in one of the 4500 unauthorized autos plying on the roads of Belgaum. Unauthorized means some without permit and few without vehicle registration, no insurance. The RTO has not issued any new permits since April this year and hence many autos are plying without permits. A couple of auto associations have now decided to approach the Lokayukta and complain to them about the RTO. If an accident occurs to such an auto who will pay the damages caused to the passenger or third party as there wont be any insurance. A number of vehicles from other cities are also plying unauthorizedly in the city and if caught get away with some hand shaking with the officials. A city where there are 4500 unauthorized autos plying what can be expected. Above that the authorized ones dont have a Meter which is the biggest headache for the passengers. Why is the RTO not issuing permits? Why the fares by meter is not implemented when under the law it is compulsory? How can 4000+ autos ply unauthorizedly isnt this a loophole even in case of security? A) Demanding Excess Fare & refusal to come for hire etc., by Autoricksaw Driver or Taxi Driver. First time 100/-, 2nd & subsequent offenses 300/-. B) As per Section 66 of Motor Vehicles Act 1988, permit is necessary. Motor Vehicles Act 1988 is the legislative directions towards the issue of permit. License relates to driver whereas permit relates to the control of operation of Motor Vehicle. Permits are issued to ply on certain routes Authorized by the Transport Authorities Auto Rickshaws are regulated by the RTO (Regional Transport Office) on the basis of motor Vehicles Act 1988 and Karnataka Motor Vehicle Rules 1989.The Regional Transport office issues the permits and number plates will be given in yellow plate with black letters. C) The autos fall under preview of S. 1(7) of the Motor Vehicles Act, which defines contract carriages. Further Under S. 67, the state govt has powers to control road transport. The state govt having regard to the contingencies mentioned in clause (a), (b), (c) & (d) may from time to time, by notification issue directions to state transport authority and RTO for fixing of fares (min & max) for contract carriages. Even under S. 74 the grant of permit is also under certain conditions, one of which is fixation of fares. 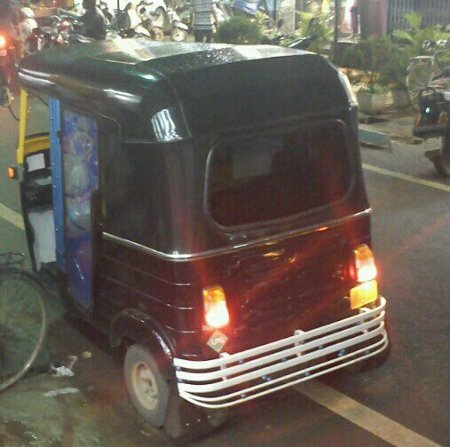 person intends to run an auto-rickshaw he has to follow the following procedures and he must not be under the age of twenty years(K.M.V.Act, 1998 section 4(2)).